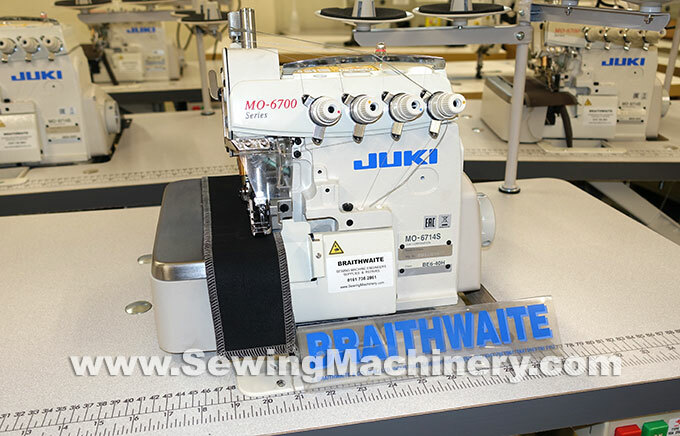 The Juki MO-6700S series responds to various kinds of sewing materials and processes, producing delicate and beautiful soft-to-the-touch seams while further reducing operating noise as well as increasing durability. This is a highly advanced cost-effective machine. The machine ensures both beautiful and upgraded seam quality at higher speeds. The MO 6700 overlock sewing machine incorporates various mechanisms as standard, such as a differential-feed micro-adjustment mechanism and an external adjustment mechanism for adjusting the feed dog inclination as well as increasing the differential feed ratio, which can be easily adjusted to finish seams that perfectly match the material to be used. MO-6704S = 3 thread single needle overlock sewing machine. MO-6714S = 4 thread twin needle overlock sewing machine. MO-6716S = 5 thread twin needle safety stitch overlock sewing machine.